The article of July 22nd on "Smoking Guns of USTreasury Monetization" hit more desks, raised more dust, and brought more attention than expected to the heightened malfeasance in progress using USGovt debt securities. The actions continue without any hint of regulatory notice or legal prosecution. The problem is more diverse than just JPMorgan sale of bonds far beyond their existing supply. Sure, the venerable colossus sold more than $2 trillion in USTreasurys than were issued in the 1990 decade. Records no longer exist. The problem goes far beyond the giant bank, which gobbled numerous other banks in the course of its reign, to become an oligopoly cog within the USGovt today. See Chase Manhattan, Chemical Bank, Manufacturers Hanover, and Bank One. Any competent student of financial economics can see that such merger is part & parcel of the Fascist Business Model, with climax merged union with the state, and certain side effect benefits of subterranean license in numerous markets like silver. JPMorgan cannot be fixed by the process any more realistically than an angry man with a vengeful heart can carve out his own cardiac pump in order to enjoy a better day. Thus no solution exists. The problem in very recent history traces back to the September and October months of 2008, when Wall Street investment banks and the US banking system suffered a death experience. These banks have not and will not recover, since they died. Some mortality events were obvious, but others remain well hidden. The big banks do not lend money since they lack vitality known to life forms, the dirty little secret. Their insolvency is easy to prove, but obscured by altered accounting rules put in place on April 1st 2009. They include generous rules that permit a broken entity to declare itself alive by filing a false accounting report, valuing their own assets at whatever suits their needs. Generally, insolvency plus illiquidity will force bankruptcy. But Wall Street and the Big US Banks appear to use naked shorting of USGovt-backed bonds to produce urgently needed liquidity. All the extreme efforts to revive the US banks appear bound in futility. Imagine numerous transfusions of a dead man in the Emergency Room of a hospital, as more blood does not guarantee a resuscitation. Some quivering of the body might take place, known to occur. More wires and tubes don't mean squat, since the guy has croaked and his corpse is rotting with a stench spreading into the corridors. The dirty secret, protected from the US public, is that the man could indeed be dead on the table. So Wall Street and the Big US Banks are likely dead. By withholding the coroner report, a storm of funding programs has been approved by the USGovt, mostly directed at Wall Street and the Big US Banks. They urgently need liquidity, and are creative how they obtain it. A near total shun of the tarnished investment banks by Main Street and the states has taken place. The private sector investment community does not float new bonds when lawsuit cases are in progress! Sure, the last Stimulus Plan sent many billion$ to the states to plug budget shortfalls. And sure, another $26 billion pittance was approved yesterday for states in a second plug. The states need several hundred billion$, or better yet, they need to see better usage of the vast funds sent to WashingtonDC, where they would not be wasted or worse. So Wall Street and the Big US Banks are likely dead. No amount of Financial Accounting Standards Board rule changes can overrule the fact that they are grossly insolvent, and worsening by the month. The housing bust and mortgage debacle delivered to them mortal blows. Many new profit or basic elite welfare programs are channeled into executive bonuses and excess cash reserves held at the US Federal Reserve, which is also insolvent, yet another major iconic zombie. Check their balance sheet for mortgage bonds worth half their value listed on the books. The financial sector players cannot have access to their cash, desperately needed and hoarded by the USFed. They must lean heavily on devices that provide cash. Their bond issuance business has dried up, amidst some fraud allegations. Their stock initial public offering business has dried up, in collateral damage to integrity. Their credit derivative business is thriving, not coincidentally since it is unregulated. Even their hedge fund business is shriveling up, a strange byproduct of Wall Street targeting and leverage backlash. Their flash trading business is intriguing, hardly a sign of free market efficiency, with bizarre outcome of a grand incestuous poker game limited to those holding Wall Street business cards. So Wall Street and the Big US Banks are likely dead. Do not count them out just yet! They have found a clever way to provide vast sums of liquidity, aided by the blind eye of USFed Chairman Bernanke. They sell that which they do not own, relying upon collusion at the top. The answers are easy. The implications are great. The impunity is disturbing. The signs of systemic breakdown are diverse. The road to perdition is clear. The path to a USTreasury default is far more obvious with each passing month. The denial is thick. The mortgage bond travesty, whose climax failure in 2008 was quite visible, went unprosecuted. So Wall Street and the Big US Banks are likely dead. A new blatant form of fraud has entered the room. Silence is deafening from the entire cast of enforcers, who have one element in common, a Goldman Sachs pedigree. Those sitting on the helm at the USFed observe the fraud first-hand. They have often stated their primary objective to aid in the promotion of liquidity to the big banks. Naked short sales of USTreasurys and USAgency Mortgage Bonds accomplishes the mission. Failures to Deliver on both types of USGovt-backed bonds are staggering. When a trade takes place, usually two to three days are permitted before the stock or bond must be delivered, so as to complete the trade, and to settle the funds transfer among parties. A year ago, vast sums of USTreasury Bonds were the subject of debate and dispute as the volume of Failures to Deliver was staggering in the months following the autumn 2008. Blame was given to the disorder that ensued from the Lehman Brothers failure, the AIG breakdown, and the Fannie Mae nationalization. No such convenient event can be blamed on the present-day Failures to Deliver. They continue for USTreasurys, and explain well the superfluous $1.5 trillion in sales. They precede the return launch of the QE2, the Quantitative Easing. Suddenly, delivery of bonds might be made easier as the USGovt floods the bond market with new issuance covered in cost by the Printing Pre$$, which USFed Chairman Bernanke claims can be operated at zero cost. The actual cost is the ruin of the USDollar image and the ruin of the USTreasury prestige. What would be the motive for naked short selling of USTreasurys in such volume? Sure, simple greed is always in the mix. Worse, Wall Street lacks legitimate business volume from which to earn profits. So Wall Street and the Big US Banks are likely dead. Wall Street continues to sell debt securities out the back door, and rake in great sums of money. When demanded to produce the USTreasurys, they cannot deliver. Thus, the Failures to Deliver. This explains the ready cash flow of liquidity to the Wall Street banks without much investment banking business. This explains the 90 consecutive days without trading loss for the lead players on Wall Street. This explains how dead zombie banks continue to operate. Word is getting out. The excess is NOT explained by USTreasury maturity, expiration, and re-sale, as some analysts claim without doing proper research, even popular radio hosts. Many people offer this simplistic explanation, but it is not correct. Mature rollover of debt is clearly labeled as such, not to be confused with utter counterfeit from naked short sales. The excess USTreasury sale (over and above USGovt deficits) is largely from naked shorting, marked by known Failure to Deliver. This explains how Wall Street and Big US Banks keep their liquidity flowing. These big banks appear to be zombies bereft of income, so they counterfeit a source of income. The big banks (including investment banks) have seen a huge decline in IPOs, Bond issuance, and their lending business is way down also, seen in the credit data. They have a big source of income in the USTreasury Carry Trade, buying long, selling short. They have been parking those profits in the USFed, earning interest as Excess Reserves. These points require repeating so as to sink in. Legitimate income is not available. A Failure to Deliver occurs when the selling party cannot locate the bond, cannot find the bond, or it does not exist. More USTreasurys have been sold than float in existence. Worse, more USAgency Mortgage Bonds have been sold than float in existence. The Wall Street and Big US Banks are engaged in basic form of counterfeit with naked short sales, as they sell that which they do not own, much like selling the Brooklyn Bridge. Some prefer to think the best, that debt is maturing and re-sold. No so! The same goes on with the USAgency Mortgage Bonds, the other victim of massive Failures to Deliver. Think the same Modus Operandi. New Issuance of USTreasurys, as the label implies, is new and not old. Many people have some confusion over what New means, which means fresh new securitizations. Rollover of old expiring maturing debt is totally different. The USGovt finance ministry calls it Rollover of Mature Debt Securities, or something similar. Anyone who follows the auctions can easily comprehend the names of auctioned securities. In a typical auction, the USDept Treasury might say "$12 billion in New Issuance plus $4 billion in Rollover of Mature Debt securities." There are dozens of examples to detect with a minimum of research. These types of USTreasury products are utterly basic and the names are plain so that common folk can comprehend. "When bond issues are announced they are all referred to as New Issuance in that they immediately (before they are auctioned) begin trading on a WI (when issued basis). But when the Government / Treasury states they issued $1.25 Trillion in New Debt securities, they are talking about an increase to aggregate outstanding, which would not include a boatload of expired debt that Rolled or replaced newly issued bonds or T-Bills. To perhaps make that a bit clearer. When the government announces they are going to issue $1.25 billion in new 5-year bonds, even if they are reopening an existing 5-year issue with a known coupon, they immediately begin trading on yield as opposed to existing bonds which trade on PRICE, as in discount or premium to par. / Rob"
They are known by many names. They are called Govt Sponsored Enterprise Bonds (GSE Bonds), or Fannie Mae Bonds, or Agency Bonds. My preference is to call them USAgency Mortgage Bonds, since they are backed by the full collusion and cloud cover of the United States Government. My claim has been consistent, that Fannie Mae is the scene for trillion$ in past theft, and that Fannie Mae is the principal clearinghouse for numerous fraud schemes in progress under the USGovt roof. Naked shorting has gone out of control with Mortgage Bonds. A fresh Bloomberg article has brought forward the evidence pointing to fraud. Naked shorting explains well the extremely high volume of mortgage bonds, including the Failures to Deliver. Wall Street and the Big US Banks appear to stay afloat from naked shorting, a type of fraud if delivery never occurs, in order to survive. They lack liquidity. The must sell something. Corporations, municipalities, and other entities observe the suspicious Wall Street behavior, their conflict of interest, their trades positioned in opposition to clients, and might have lost trust. The Wall Street community activity centered upon naked short sales of USAgency Mortgage Bonds seems clearly to complement their naked shorting of USTreasurys. So Wall Street and the Big US Banks are likely dead. The USTreasurys are the prima facie in the case to be brought for large scale fraud, sufficient for indictment. The USAgency Mortgage Bonds are the second part to the story, worthy of important support toward conviction. The difficulty of executing transactions tarnishes the image of the $5.2 trillion mortgage bond securities market, which is the most liquid behind USTreasurys. That is precisely why the Fannie Mae bonds can be sold so easily without ownership. With heavy volume comes heavy cover for fraud. In the aftermath of the USFed's $1.25 trillion of mortgage bond purchases over the last 18 months, they have exposed the market as broken. After acquiring about one quarter of home loan bonds with USGovt-backed guarantees to buttress the housing prices against the threat of freefall, to save the mortgage bond market from outright freefall, and to build a flimsy safety net for the USEconomy, the USFed made some securities too hard to find. In essence, the USFed exposed the vast fraud by Wall Street and the Big US Banks by scooping up the objects used in sales without ownership, known usually as counterfeit. Caroline Salas and Jody Shenn started off in their article with a powerful salvo. They wrote, "For all the good the Federal Reserve's $1.25 trillion of mortgage bond purchases have done, they have also left part of the market broken. By acquiring about a quarter of home loan bonds with government backed guarantees to bolster housing prices and the US economy, the Fed helped make some securities so hard to find that Wall Street has been unable to complete an unprecedented amount of trades. Failures to deliver or receive mortgage debt totaled $1.34 trillion in the week ended July 21, compared with a weekly average of $150 billion in the five years through 2009." The last sentence is crucial. It is a smoking gun of USAgency Mortgage Bond fraud, not of monetization. In fact, the fraud is the obverse side of the coin whose face features blatant bond monetization. The US financial coin has monetization on its face and bond fraud on the obverse, the unfortunate output of a fiat currency system in its final phase. Thomas Wipf chairs an industry group that is trying to address the problem. The fraud is in the open, but almost never discussed in the financial press or on the air of financial networks. Wipf is chairman of the Treasury Market Practices Group and the head of a bond group at Morgan Stanley. He is concerned about exacerbated damage caused by the collapse of a bank or fund. Translate that concern, as Wipf is worried about exposure of bond fraud by Wall Street and Big US Banks during a routine bank failure. Wipf said, "You are adding systemic risk into the market. Investors are taking on counter-party risk in trades they did not intend to take on." Numerous other bank and bond analysts have covered this story, but they continue to portray it as a problem extended from the confusion in the credit markets. Wall Street and the Big US Banks struggle to remain in operation, and are using naked shorting of USGovt-backed bond securities to remain alive. They know well that the USDept Treasury, the Securities & Exchange Commission, and the Office of the Comptroller of Currency have done nothing. They are dominated and controlled by Goldman Sachs, each head holding a GSax pedigree. No prosecution for bond fraud has happened or is a probable event. In fact, some research might expose that Goldman Sachs could be the greatest offender in the game that shows Failures to Deliver in high volume. They are principal players in such markets. The Bloomberg authors Salas and Shenn point out the ripple effect, the daisy chain of unsettled trades that occurs when a broker dealer acting as a buyer in one transaction fails to deliver those bonds as a seller in another. Even Moodys Investors Service is on the sordid story, but not likely to make any bold stand. Senior analyst Alexander Yavorsky at Moodys is concerned about the drag on the mortgage bond business, when he should be more concerned about gross malfeasance within the business. Obviously, if reduced liquidity in the mortgage bond market persists and causes investors to seek other assets, the consequent effect would run counter to the USFed's goal of buoying demand for the securities. The official program (dubbed QE1) began in January 2009 and officially ended in March. Tragically, in the United States of America, bond fraud in the securities markets is not pursued vigorously by the regulators, by the central bankers, and by the finance ministries. If truth be known, Wall Street and the Big US Banks are likely dead. Authors Salas and Shenn had better be careful, as they have brought to the forefront a high risk story. See the Bloomberg article It is entitled "Fed Finding No Good Deed Goes Unpunished With Mortgage Bond Trades Failing." Friend and colleague Aaron Krowne is the owner and editor of the Mortgage Lender Implode website. He is an astute bank analyst with a keen alternative viewpoint. He wrote in an email, "Looks like a side effect of the USFed's massive mortgage buying is causing the 'tide to go out' on this market, revealing massive manipulation, or at least, incredibly unsound synthetic derivatives trading on these major fixed income bonds." Wall Street built countless leveraged and artificial bonded securities, mostly atop shifting sands. A great unraveling is in progress, and so is a great awakening in progress. The leverage and the makeup of the structured finance platforms devised by Wall Street and the Big US Banks is unraveling. As it does so, the fraud appears to be gradually exposed. As it does so, the faulty reckless construction of financial engineers is exposed. As it does so, the vulnerable heart & soul of fiat currency systems is exposed. As it does so, the uncontrollable growth of debt originating from the United States is exposed. As it does so, the path to the USTreasury default is exposed. 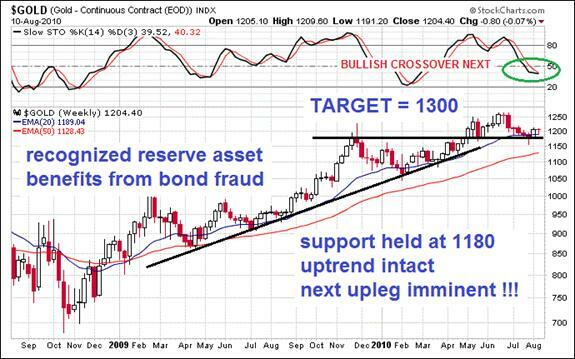 As it does so, the only legitimate financial asset in a paper-driven world is exposed, GOLD. As the Wall Street and Big US Banks are recognized as most likely dead and defunct financial firms, whose main source of liquidity funds is naked shorting, reliant upon the high volume counterfeit of both USTreasurys and USAgency Mortgage Bonds, the ruined condition of bonds is exposed. They are the primary instruments for the fiat currency system. As it does so, the only legitimate financial asset is exposed, GOLD. Money today is no different from denominated debt coupons. GOLD IS MONEY AND ALWAYS HAS BEEN MONEY, as John Pierpoint Morgan once said before the USCongress. The USGovt backs with guarantees the USTreasurys. If such debt securities are the exposed object of multi-trillion$ naked shorting in order to avert a death experience by Wall Street and the Big US Banks, then the faith, confidence, and prestige of the USDollar will be harmed irreparably. The alternative is clearly GOLD. The USGovt backs with guarantees the USAgency Mortgage Bonds. If such debt securities are the exposed object of multi-trillion$ naked shorting in order to avert a death experience by Wall Street and the Big US Banks, then the faith, confidence, and prestige of the USDollar will be harmed irreparably. The alternative is clearly GOLD. Bear in mind that the European and British government bond markets are suffering deep damage. Confidence is fast disappearing. Weaker nations are seeing a vanishing act from bidders and buyers of their bonds. Sovereign bond supply is growing during the crisis without respite. Austerity measures imposed upon government budgets are a ruse, an impossibility for political reasons. Deficit reduction will be minimal, if at all. If such debt securities are exposed as objects of unfixable impairment, then the faith, confidence, and prestige of the all major currencies will be harmed irreparably. The alternative to extreme malfeasance in the government bond market is clearly renewed demand for GOLD. The laggard US public will figure it out, only when the GOLD price penetrates the $2000 level, or when the SILVER price penetrates the $50 level. Until then, GOLD shines with an insufficient crowd of advocates. The next big upleg will occur when the number of people on the GOLD/SILVER train is reduced to a minimum, after the usual chicanery. That day might be in the coming few weeks.